Edgar Winter was one of the most popular rock artists of the 1970s. From his solo debut – 1970’s Entrance – through his first album of the next decade (Standing on Rock, 1981), Winter crafted catchy and intriguing music that folded in the many styles of music that had influenced him. From gritty rhythm and blues to futuristic synthesizer-based songs, from boogie and glam rock to soulful ballads, Winter and his various groups made music that would endure. He is best remembered for his 1972 instrumental hit “Frankenstein” (at #18, his only hit single in the UK), but Winter scored seven hit singles on the US Hot 100 chart, and eight of the eleven albums he released while signed to CBS/Epic and associated labels would break the US Top 200. A new compilation of Edgar Winter’s best and most popular songs from that era is being released this summer by Real Gone Music. The Definitive Collection brings together 30 songs on two discs. I spoke at some great length with Winter, and that conversation forms the basis of the liner note essay included with the 2CD set. But the more than three hours we spent discussing that fertile period of Winter’s work yielded much more than the liner notes could hold. One of the keys to Edgar Winter’s success in the 1970s was his astute choice of collaborators. While a fine singer, songwriter and multi-instrumentalist in his own right, Winter understood the importance of assembling the right band for the right project. 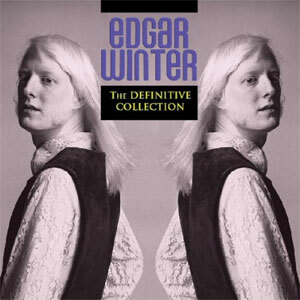 As a result – and to the confusion of those who prefer a tidy discography – his 70s LPs were variously credited to Edgar Winter, Edgar Winter’s White Trash, The Edgar Winter Group, and The Edgar Winter Group featuring Rick Derringer. And that list doesn’t even include his collaborations with his brother, legendary blues guitar ace Johnny Winter. Over the course of our two wide-ranging conversations, Edgar reminisced about several musicians, each of whom played a significant role in the music he would record, release and perform live. “Ray Charles was a big influence for Jerry, the other lead singer in White Trash,” Winter says. “Jerry LaCroix was one of the most soulful white vocalists ever.” While LaCroix is shown to good effect on Edgar Winter’s White Trash, perhaps his finest recorded moments are found on the group’s incendiary 1972 live album, Roadwork. Edgar characterizes the high energy gospel-infused “Save the Planet” as the group’s evoking of a Pentecostal tent revival, and LaCroix’s lead vocal is at the center of the arrangement. After Edgar broke up White Trash, LaCroix would release a solo album, The Second Coming, and go on to brief stints fronting Blood, Sweat & Tears (he’s on their 1975 Mirror Image LP) and Rare Earth. By the 1990s he was out of the music scene completely, though he was inducted into the Louisiana Music Hall of Fame in 2012. Two years later, LaCroix passed away, a victim of congestive heart failure. Guitarist/producer Rick Derringer played with Edgar Winter’s White Trash in 1971-72; he was also a member of The Edgar Winter Group in 1974-75. But Derringer had enjoyed a taste of musical success long before he crossed paths with Edgar Winter. Born Ricky Dean Zehringer, he would form The McCoys, and score a 1965 hit with “Hang On Sloopy” when he was only 17. “I met Rick through our manager Steve Paul,” Edgar says. “Steve had taken us to a club in New York called the Tarot. Rick was playing there with The McCoys. Johnny and I had played ‘Hang On Sloopy’ in clubs, but I had never really listened to The McCoys as a band. So I was immediately blown away; I recognized Rick as sort of a kindred musical spirit.” Edgar feels that was unusual, since Derringer grew up Ohio, in a part of the US that’s very different than Winter’s native Texas. “He has deep blues roots, and obviously listened to the same music that I grew up with,” Edgar says. A couple of years later, after Ronnie Montrose left The Edgar Winter Group, Derringer joined. The resulting album found him co-billed: The Edgar Winter Group featuring Rick Derringer. Describing that album as “an aggregate effort,” Winter says, “I saw no reason why that band shouldn’t continue on that basis.” His idea was that each member could do his own solo project, but the group would reconvene for albums and live dates. But individual interests and ambitions would fracture that lineup, too. Rick Derringer began his solo career alongside his involvement in Edgar’s projects, and his version of “Rock and Roll, Hoochie Koo” was the most commercially successful of all recordings of the song, peaking at #23 on the Billboard Hot 100 chart. He has released more than a dozen albums, and has guested and/or collaborated on many other musicians’ recordings, including releases from Steely Dan and Todd Rundgren. Derringer was reunited with Edgar when both were members of Ringo Starr’s All-Starr Band in 2010 and 2011; he continues to record and tour. “When you’re putting a band together, you have to look at the chemistry,” Edgar says. “I liked the idea of having a wild and crazy guy on guitar.” He raves about the “spontaneity that Ronnie always brought to the music.” But those same qualities that made Montrose such an effective part of the band all but guaranteed that his time with the group would be short. Though he had only joined The Edgar Winter Group in 1972, by the following year Montrose would be gone. Montrose’s ambitions led him to form a self-named group in 1973. Montrose (the group) would release five albums of original material. As a solo artist, Ronnie Montrose released nine long players; he also led the group Gamma for a few years (1979-82, and a 2000 reunion); Gamma released four albums’ worth of music. An always in-demand session guitarist, Montrose lent his guitar skills to albums by artists ranging from Gary Wright to Jefferson Airplane‘s Paul Kantner to Van Morrison, the Neville Brothers, Herbie Hancock and many others. Ronnie Montrose and Edgar Winter remained on good terms long after the guitarist left Edgar’s group; Open Fire, Montrose’s 1978 album of instrumentals was produced by Winter, who also played piano, harpsichord and synthesizer in addition to co-authoring two of the album’s tunes. Montrose developed prostate cancer in 2007. Reportedly suffering from clinical depression, he died in 2012, the result of a self-inflicted gunshot wound.